Two clever mice try a balancing act but are interrupted by friends who want to play too in this delightful Classic Board Book that's "just the right size for small hands and sharing one-on-one" (Booklist). Two mice make a teeter-totter. They're balancing just fine, but then along comes a frog. Can they make room for one more friend on their teeter-totter? What about two? What about more? But then a big bird comes along and wants to play too. Better watch out! 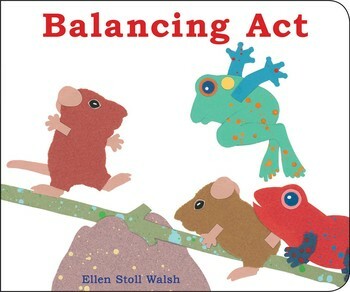 Ellen Stoll Walsh’s ‘Balancing Act’ (2010) follows two mice who play on a seesaw, made of a long stick sitting on a big rock. Then, a salamander jumps onto one side of the seesaw, tipping the seesaw to that side. Thankfully, another salamander of a similar build and size to the first one jumps onto the other side of the seesaw, balancing it again. Then, more animals want to join in the fun. Despite the simple storyline, the story does a wonderful job in introducing the concept of balancing and weight comparison to very young children. We can easily see how teachers and parents, after reading the story, can, for example, get their children to use a rocker scale and Unifix cubes to either retell the story or create their own story with new animal characters. Children can also be encouraged to make a prediction on which side of the rocker scale will tip once additional Unifix cubes are being added to either side each time. The story (and the said follow-up activity) will also be useful to help children see that sometimes one single object (e.g. a book) can be as heavy as several Unifix cubes together. All in all, ‘Balancing Act’ provides a perfect context to introduce the concept of balancing and weight comparison to children aged 4+ years old.